vScope 3.4 is a major upgrade of the functionality in vScope. The most obvious thing is the newly design Dashboard that takes collaboration to a completely new level. However, we have also made performance improvements in the backend to enhance the overall vScope experience. The most obvious change in vScope is the redesigned Dashboard. The new Dashboard introduces new features and values that aligns with vScope’s overall benefits: accurate information to the right people at the right moment. The biggest news (except the dazzling new design) are the collaboration features, new widgets and support for multiple dashboards. You can read all about it here. 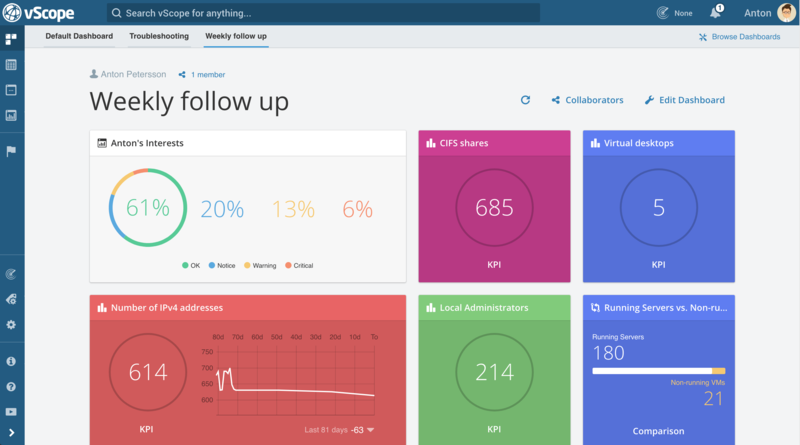 Share your Dashboards with team members, external consultants or if you’re a hosting provider, your customers. The collaboration features put you in charge of information distribution. Add other vScope users and assign their permission level to your Dashboard with just a few clicks. Besides the KPI, Ratio, Top 5 and Tracker widget that was available before vScope 3.4, you now have access to a Comparison widget. Perfect to track the relationship between two values. 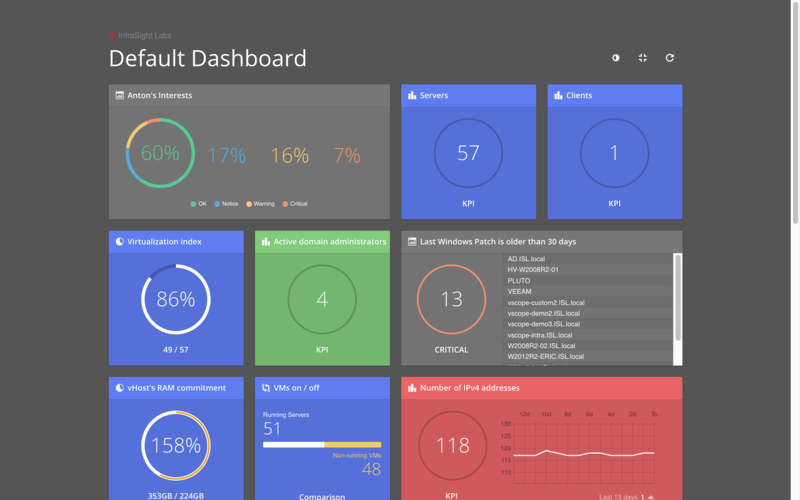 Probably one of the most requested features – multiple Dashboards. In vScope 3 you no longer need to gather all your important widgets in one Dashboard. Instead, craft dedicated Dashboard views for various use cases or people in the organization. By choosing favorite Dashboards you can put the most important ones in the top bar of your Dashboard for easier access. Piece of cake! NOTE – This feature requires vScope 3. In vScope 3.4 you can view all machines from your Active Directory directly in vScope. The information found about machines in the directory is however quite limited which means that it is not sufficient to build a proper documentation on. The neat (and unique) thing with vScope is that this information is correlated with information from eg. WMI and VMware which will help you get a much better understanding of how your clients and servers are configured and used. How many laptops are in our AD? How many machines have been used within the last 90 days? What applications are installed on my directory laptops? 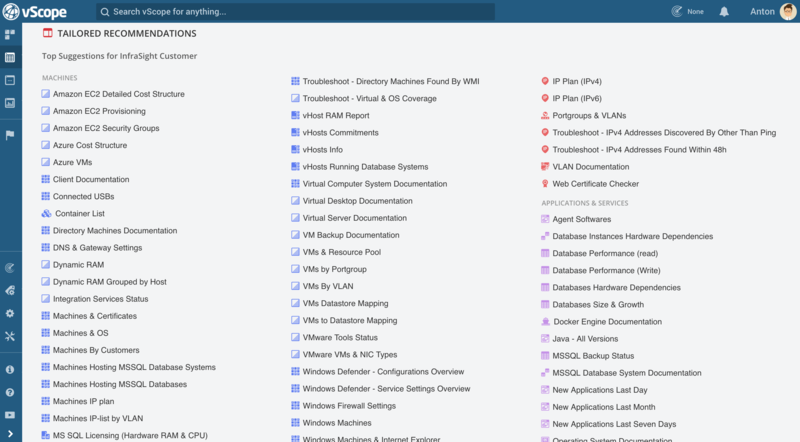 How well is my client discovery coverage in vScope? NOTE – This feature requires vScope Directory. For many of you interested in billing and capacity planning this new feature will help you get an even better overview of your backup performance. If you have enabled per VM backup in Veeam, vScope 3.4 will now help you visualize the growth and size of this. Why not build a widget for it? NOTE – This feature requires vScope Backup. Maybe you are trying to keep up with your documentation manually by adding notes next to your machines in some kind of spreadsheet (if you are familiar with vScope you know that this is something that really should be automated. Have a look at this video to learn more about tagging in vScope). Now when you have vScope you would like to reuse all the tags that you’ve already added in another document/system. How do you proceed? In vScope 3.4 you can import tags from eg. spreedsheets into vScope by matching on for example name of a resource. The tags will be converted into “manual tags” in vScope. Learn how to import tags with this guide. While updating the Dashboard we decided to rebuild all Tailored recommendations to better fit the needs and feedback from our customers. We now have around 120 dynamic tables that will be displayed depending on what is found by your vScope installation (and products licensed). And don’t forget the 70+ widgets added. We have added a nice little touch to the Dashboard. Full screen mode and with a theme that makes the widgets pop! We are working on two major functionality improvements in vScope including new information from Microsoft IIS sites and adding price information to vScope. Our aim with IIS is to help organizations better understand configurations and settings closer to the end-user. The Chargeback & Billing functionality is your way to gain better visibility of costs of the IT. Features that facilitates automation of the billing process for both hosting providers and organizations in need of better Chargeback routines. We would love to hear your feedback! If you are interested in evaluating IIS and Chargeback & Billing in vScope please contact support@infrasightlabs.com. Files Reached Max Size will now only list files that have autogrowth active. Files with static size will not be shown. Tag: “Running as” for database systems showing what user is running the database session. If an owner of a table is removed from vScope, null was showing as owner. That’s wrong. If an owner of a tracker case is removed from vScope, null was showing as owner. That’s also wrong. Transaction locks for MSSQL was showing the wrong value since it was kept for too long time.